Do you have a "Rocky Raccoon" spring animal sitting in a drawer that you've never really performed? You've seen it done well on TV and magic conventions getting huge laughs from laymen. The problem? You've never learned how to do it correctly. Now you can get the training you need to maximize audience impact. 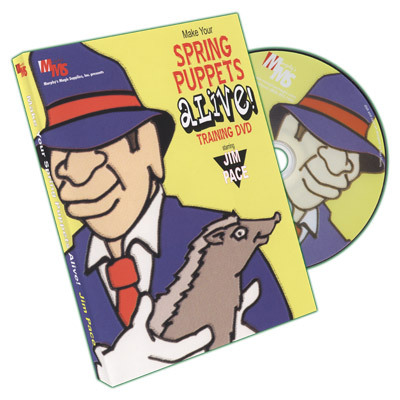 Jim Pace's video download Make Your Spring Puppets Alive - The Training Download, will help you give the spring puppet that you bought years ago a life of its own. What we at AmazeKids like about this download is that it's just 16 minutes -- short and to the point. You'll learn how to manipulate the head, tail and body to give your spring creature a life-like animation that will have children and their families wondering if it's actually alive. The truth is, it's not difficult to learn how to handle these puppet props. The key is to break down the moves into separate manipulations, approaching each one individually before combining them into a whole routine. Jim will show you how! The video download does not include the puppet. It's been created for those of you who have the puppet, but need a tutorial by an expert so you can learn the details of the handling. Once mastered, you'll be well on your way to making your "Rocky Raccoon" or "Roxie Raccoon" or any of their "cousins," part of your repertoire -- with a routine that will continue to delight your audiences for years to come.